TEAC unveils new headphone amplifier with built-in DAC | What Hi-Fi? TEAC has announced the launch of its new HA-P50 – the Japanese manufacturer's first portable headphone amplifier that comes with a built-in 24/96 USB digital-to-analogue converter. 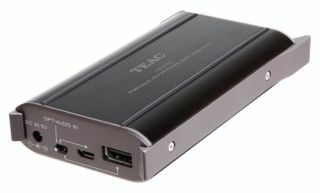 According to TEAC, the device has been designed to provide "superior sound quality – both on the go and at home". It also supports high-resolution audio playback for portable devices. Among the main features of the HA-P50 is its ability to accept a digital USB input from either iOS or Android devices, and a USB-rechargeable Li-ion battery for eight hours of playback. Of course, its 24/96kHz high-resolution audio support is a key element of the new HA-P50 and it is made possible thanks to the BurrBrown PCM5102 DAC the TEAC uses. You won't need an Apple Camera Connection Kit when using the TEAC HR Audio Player for iOS high-resolution audio playback app – free for Apple devices such as iPads and iPhones. Meanwhile, the optical digital input jack lets you connect the headphone amp directly to portable players or CD/DVD/Blu-ray players and there's also a high/low gain selector. The TEAC HA-P50 is now available for £300.